Celebrating the director’s methodology, when the screen time arrives for it Jesus begins his ministry at a breakneck pace, admonishing some travelers to repent as he hurries past them on the road; Pasolini cuts back to the travelers for a low-comedy but credible Who-is-this-clown? take; and barely another beat has passed before we’re at the Sea of Galilee and Jesus is punning to lure fishermen to follow him. With the barest minimum of footage given to establishing shots or transitions, Pasolini spends the next 90 minutes or so studying miracles and parables and Passion events with the same economical, linear energy that heralded their beginning. Take the Money and Run and Bananas, Woody Allen’s first films as a writer-director-actor, were energetic messes redeemed by the novelty of seeing Allen’s comic vision transferred to the screen minus the dilutions of What’s New, Pussycat? and Casino Royale, on which he performed script and acting chores only. (Allen also worked on the experimental What’s Up Tiger Lily?, unseen by this viewer; and Don’t Drink the Water was based on an Allen stageplay.) Take the Money and Run and Bananas invoke far less the Buster Keaton–Charles Chaplin tradition of comedy actor-directors than they do the indulgent tradition of vehicle comedians such as the Marx Brothers and W.C. Fields, the excesses of whose generally funny films one almost invariably must be blind to in order to call the films themselves—as opposed to the comic performances—successful. In these early efforts one could forgive Allen his excesses, too, in order to get to the laughs because, after all, the man was still learning his craft. 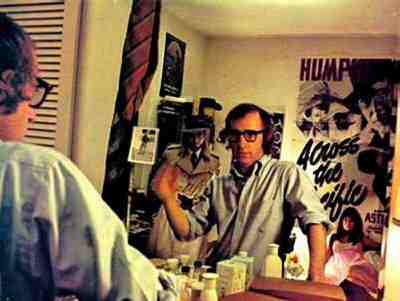 Nineteen-seventy-two was the year that Allen seemed to arrive as a filmmaker and performer. The Allen-scripted, Herbert Ross–directed Play It Again, Sam benefited from the discipline Allen found necessary to include in its stageplay antecedent, and the cinematic and cosmic inevitability of its Casablanca-remake conclusion carried with it a surprisingly touching and self-informed realization of Allen’s comic persona. In contrast to Allen’s own egocentric directorial tendencies, Ross’s generally undistinguished direction contained two minor, but in retrospect significant, virtues: Meaningful presences other than Allen were permitted onscreen—Diane Keaton, Jerry Lacey, Viva, Susan Anspach; and for once Allen himself was guided successfully through a physical universe. Compare the economy and dramatic utility of the record-casting gag in Play It Again, Sam with the pace-, grace-, and proportionlessness (this from a man who studied with Martha Graham, and fancies himself a jazz musician) of another prop gag, the basketball business in Bananas, a bit that is flatfootedly typical of actor Allen’s attempts under his own direction at the sight-gag subspecies of physical comedy. (There are exceptions, of course: The wheelchair business in Sleeper, Allen’s fourth film as a director, comes instantly to mind, but even here actor Allen is subservient to the scene’s dramatic tension—the risk of discovery—and the upfront emphasis on mechanical anarchy.) Klutziness requires grace to define it, and the relative gracefulness of Play It Again, Sam‘s physical and behavioral environments imparted to Allen’s physical comedy a sense of chaotic interruption that his own (up until then) perpetually chaotic film environments did not underscore. Children are scolded it’s a “solemn occasion” that they’re travelling to: Tacchella cuts to their grandmother the bride chugging beer at her wedding reception and then to the grandchildren seated behind their own rose-colored soft drinks. Bridegroom Gobert’s pants go down at the peak of the celebration, and “Cousin” Ludovie’s wife Kanne’s skirt goes up to reveal motorcycle-riding underwear as the focal couples’ reunion with their spouses signals the festivity’s end. “Cousine” Marthe’s husband Pascal ends a string of affairs in relief against a background of brown purses, then white pharmaceuticals, then an environmentally complementary family-planning clinic where the rhythm of the philanderer’s new-leaf-turning montage is interrupted and altered to comic effect. Such cutting, color, contrasts and expectation thwartings are the subtext upon which Cousin, Cousine’s more obvious charms of character and situation rest. Iâ€™m not an adventurous filmgoer. Meaning Iâ€™m very seldom in the house for a first-run Hollywood picture. Thereâ€™s generally a lag of a few years â€“ during which a film acquires something of a reputation, or maybe I caught part on it on television â€“ that Iâ€™ll check it out more fully. And then â€“ if it really makes an impression â€“ look for a theatrical revival. Such was the case â€“ and to the credit of the Egyptian Theater here in the Seattle area â€“ that I had the opportunity to catch up to Quentin Tarantinoâ€™s Reservoir Dogs and Pulp Fiction at weekend midnight screenings. The following pages of this cover file introduce the other four file uploads, plus other work samples through which I hope to persuade you to sponsor my plan for a stereoscopic three-dimensional news beat. Then there are the films and filmmakers that Iâ€™ve admired maybe even back as far as when I was a little kid watching them on the late show. And have always wanted to see in a theater at least once before I die. So the best revivals of 2009 that Iâ€™ve seen, is the theme of my ten-best-films list.